The Olympics are over, which is sad. But every cloud has its gold lining: No more Ryan Lochte! At least, one would hope after this latest interview. The bleach-blonde waterkind sat down with The Today Show's Matt Lauer to discuss the "incident" in Rio. At one point an armed robbery, at another an all-out assault on gas station door, the Real Swim Shady's story took more turns than a 4x100m medley relay. And now, he's just sorry. If you give up before getting through the 1-minute pre-roll ad (sigh), fret not, as there's far more cringe-iness on the other side during the 13-minute segment. 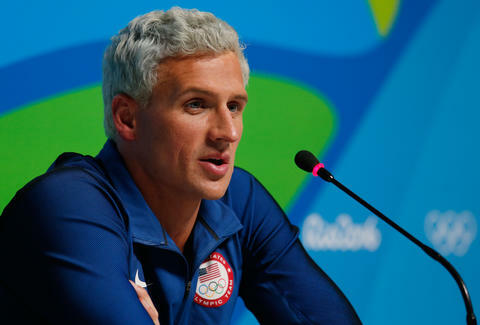 "I left certain things out," Lochte, now with a more natural hair color, told Lauer, "and I over-exaggerated some parts of the story." Lochte in this part was referring to his initial tale, told to Today Show host Billy Bush, where he said a cocked gun was pointed at his forehead. "It was still hours after the incident happened... I was still intoxicated. I was still under that influence. I'm not making me being intoxicated like an excuse. I'm not doing that at all. It was my fault," Lochte said to Lauer. Only after teammates Gunnar Bentz and Jack Conger were pulled from a plane leaving Rio, and James Feigen had his passport impounded, did Lochte come forward with the rest of the story. According to this version, corroborated by a police statement from Bentz, guards at the gas station struck a deal of sorts with the swimmers to pay for damage from the Olympians' vandalism at the gas station -- which was brokered by a third party who translated for both sides. If you manage to get jolly ol' Al Roker that worked up, you definitely fucked up. Lochte's now paying the consequences, too, aside from public scorn: ABC News reports Speedo USA has ended its sponsorship of Lochte, hitting the Olympian in the wallet. Speedo had sponsored Lochte for a decade. At 32, Lochte's time as an elite athlete has likely ended. Though he won 12 Olympic medals for his country -- good for 13th all time -- his legacy will now most likely be as the yarn-telling fibber at the center of a controversy that didn't need to be -- all because he was embarrassed about beating up a gas station poster after a night of drinking. The interview of the 32-year-old Lochte seems more like what you'd hear from a 12-year-old whose little white lie snowballed into an international incident, and serves as a continuation of his apology issued on Instagram on Aug. 19. It's safe to say Lochte didn't consider the ramifications of busting up a gas station in Rio and then portraying himself as the victim in a city with a reputation for making many into victims. Mind you, this is the protagonist of an E! reality show that only managed to last eight episodes. Ryan Craggs is Thrillist's Senior News Editor. He hung out at a gas station in Rio the previous weekend, too, but managed to not beat up any inanimate objects. Follow him @ryanrcraggs.